The ZOLL AED Plus® is the only Full-Rescue AED that supports both CPR and defibrillation. For infrequent rescuers, the AED Plus supports the complete chain of survival. The unique graphical user interface – pictures combined with text displays and voice prompts – helps the rescuer perform every important life-saving action every step of the way. COMPRESSIONS,” and an adaptive metronome to guide compression rate help accomplish quality compressions. Sudden cardiac arrest (SCA) simply means that the heart unexpectedly & abruptly stops beating. This is usually caused by an abnormal heart rhythm called ventricular fibrillation (VF). The only effective treatment for VF is Defibrillation. However almost equally as often as Ventricular Fibrillation, the presenting rythmn is Asystole or PEA (pulseless electrical activity) where a defibrillator would advise “NO SHOCK” and the only effective treatment is good quality CPR. No. A heart attack is a condition in which the blood supply to the heart muscle is suddenly blocked, resulting in the death of part of the heart muscle. Heart attack victims usually (but not always) experience chest pain and usually remain conscious. Heart attacks are serious and sometimes will lead to SCA. However, SCA may occur independently from a heart attack and without warning signs. SCA results in death if not treated immediately. While the average age of SCA victims is about 65, SCA is unpredictable and can strike anyone, anywhere, anytime. And is increasingly affecting younger people. VF is an abnormal heart rhythm often seen in SCA. This rhythm is caused by an abnormal and very fast electrical activity in the heart. VF is chaotic and unorganised; the heart just quivers like jelly on a plate and cannot effectively pump blood. VF will be short lived and deteriorate to asystole (a flat line) if not treated promptly. The only effective treatment for VF is an electrical shock called defibrillation. Defibrillation is an electrical current applied to the chest. The electrical current passes through the heart with the goal of stopping the VF and giving an opportunity for the heart’s normal electrical system to take control. This current helps the heart reorganise the electrical activity so it can pump blood again. An automated external defibrillator (AED) can defibrillate the heart. An AED (Automated External Defibrillator) is a device that analyses and looks for shockable heart rhythms, advises the rescuer of the need for defibrillation and delivers a shock if needed. The steps for shocking an SCA victim are simple and straightforward. The AED Plus® provides visual and audio prompts required for the entire resuscitation process. The most difficult part is recognising the need for defibrillation. Do CPR only until the AED arrives. Apply the electrode pads to the victim’s bare chest and follow the voice prompts and messages of the AED. It will tell you when to resume CPR. CPR provides some circulation of oxygen rich blood to the victim’s heart and brain. This circulation delays both brain death and the death of heart muscle. CPR also makes the heart more likely to respond to defibrillation. AEDs are extremely safe when used properly. The electric shock is programmed to go from one electrode pad to another through the victim’s chest. Basic precautions, such a verbally warning others to stand clear and visually checking the area before and during the shock, will virtually ensure the safety of rescuers. What if the victim has a medication patch on the chest where I want to place the electrode pads? Never place AED electrode pads directly on top of medication patches, such as nitroglycerin, Hormone or Nicotine patches. Patches should always be removed and the skin wiped dry before placing electrode pads on the skin. No. The electrode pads remain on throughout the resuscitation and until the victim is transferred to advanced care providers such as the paramedics. If the electrode pads are in their correct locations on the victim’s chest, they will not interfere with proper hand placement or compressions. 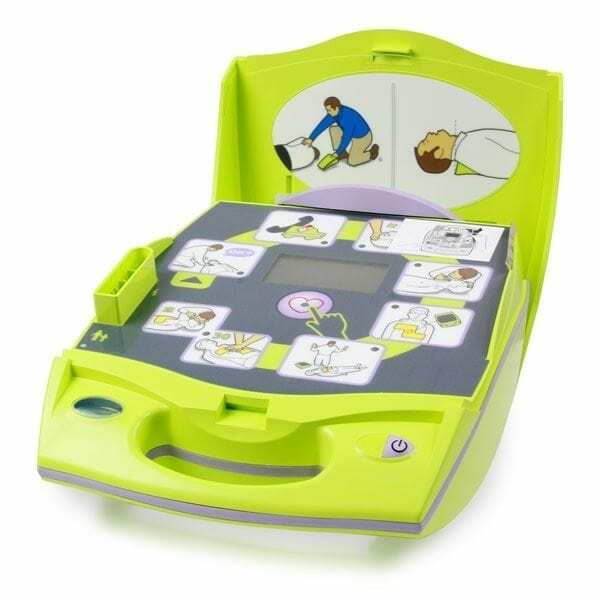 In fact the CPR D Padz which ordinarily come with the AEDPlus not only aid hand placement but also enhance the quality of CPR delivered to the victim. Yes, never withhold the use of an AED on a person with SCA. Electrode pads must come in direct contact with the skin. If the chest hair is so excessive as to prevent good adhesion of the electrode pad, the hair must be removed quickly. The ZOLL AED Plus CPR-D-padz come with a small emergency reponse kit which contains a disposable razor. Yes, even after a victim has been successfully defibrillated, he/she is at risk of developing VF again. The AED will continually monitor the victim for the return of VF. If VF is suspected, the AED will automatically begin to analyze victim after two minutes of CPR is complete. The AED should be left on until emergency personnel assume responsibility for the victim. I used an AED on a SCA victim and the AED always prompted “No Shock Advised”. Even with CPR the victim did not survive. Why didn’t the AED shock this victim? I shocked a woman in SCA within minutes after she collapsed. I hear later that she did not survive.Did I do something wrong? Unfortunately, because of other underlying medical or heart problems, not all victims of SCA who are in VF will survive even if defibrillation is done promptly & correctly. SCA is a high stress situation. Even experienced health care providers do not do everything perfectly. In SCA, performing CPR and using an AED can only help the victim. The AED Plus is designed to help improve the quality of CPR delivered, which can only be a good thing as far as the victim is concerned. Remember this rule: only use an AED on someone you would do CPR on – unresponsive and not breathing. No the pictures do not stop you from immediately attaching the CPR D-padz Electrode. In this way in the ZOLL AED Plus works like any other ordinary AED. Once the electrodes are attached it will begin analysis automatically and in this respect works just like the early model AEDs. yes, as long as the usual safety rules are observed. Be sure the victim’s chest is wiped dry and keep the electrode pads away from a damp or conductive surface.